Paramount has unveiled a new poster for Bumblebee. The San Diego Comic-Con exclusive poster made its way online following the studio's presentation for the upcoming Transformers spin-off at the event. Unfortunately, they have yet to release any of the footage that was screened, which sounds like it was pretty fantastic, but this poster is also quite great and further gives us hope that this may be taking the franchise in the right direction. This is yet another very solid poster for Bumblebee, following in the footsteps of the previously released theatrical poster and the fresh Bumblebee Comic-Con footage. This one takes a more comic book/street art approach. 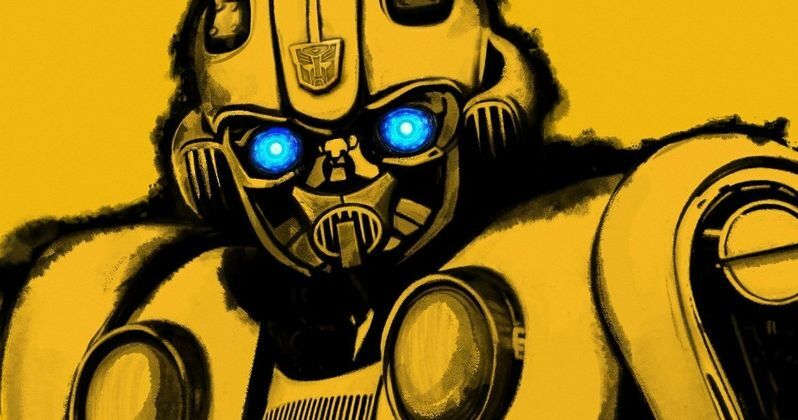 The entire thing is draped in yellow and black, the titular Autobot sketched out in black against the yellow background. His classic VW Beetle form is seen driving through his legs at the bottom. If you had never seen a Transformers movie before, you would probably be convinced this movie is going to be downright excellent. However, five Michael Bay explosion-fests later and fans may be, understandably, feeling a bit of trepidation. Still, it's hard not to be cautiously optimistic at this point. The cast includes Hailee Steinfeld (Edge of Seventeen), Pamela Adlon (Better Things), John Cena (Blockers), Stephen Schneider (Broad City), Jorge Lendeborg Jr. (Spider-Man: Homecoming), Jason Drucker (Diary of a Wimpy Kid: The Long Haul), Kenneth Choi (Captain America: The First Avenger), Ricardo Hoyos (Degrassi: Next Class), Abby Quinn (Landline), Rachel Crow (Deidra & Laney Rob a Train) and Grace Dzienny (Zoo). Angela Bassett (Mission: Impossible - Fallout}) is on board as the voice of Decepticon Shatter, with Justin Theroux (The Leftovers) set to voice Decepticon Dropkick. It was also confirmed at SDCC that the fighter jet Decepticon in the movie is Blitzwing and not Starscream, as was previously speculated. Despite the fact that the Transformers movies, especially the last two of them, have been major disappoints to what would seem to be the majority, the franchises has grossed a staggering $4.38 billion worldwide. Granted, 2017's The Last Knight took a nosedive, grossing a full $500 million less than 2014's Age of Extinction. Still, Paramount isn't prepared to just let this cash cow die and they're trying to reinvent things with Bumblebee. This will be the first movie in the franchise not directed by Michael Bay. Instead, Kubo and the Two Strings helmer Travis Knight has stepped into the director's chair. Bay still has a producer credit on the movie though. It's going to be a battle at the box office later this year as Aquaman, which debuts its first trailer tomorrow, is scheduled to come out on the same day as Bumblebee on December 21. It will be interesting to see if they both stick to that release date. For now, it appears as though that's going to be the case. While we wait for some of the footage shown at SDCC to make its way online, be sure to check out the new poster, courtesy of the official Bumblebee Movie Twitter account, for yourself below.